Damaris Chance did not wish to marry. She wanted the independence to live her own life, in a little cottage. She had been lucky to meet her three sisters. They were four women who had banded together and made a decision to become sisters. And she appreciated everything Lady Beatrice had done for them. She had allowed the four of them into her home, and claimed them as family. That, however, did cause some issues as all of them had to keep up with Lady Beatrice's artistic license of their past. Freddy Monkton-Coombes did not wish to marry. He was quite happy with the life he had made, and wished to steer clear of muffins - the debutantes continually thrown in his path while out in society. Unfortunately, his good friend Max had just married one of the sisters and they were leaving on their honeymoon. Max asked Freddy to keep an eye on Lady Beatrice and the three remaining sisters. The sisters didn't worry him as much as Lady Beatrice, that woman could cause problems with things she didn't say. Freddy was in for a surprise when he encountered Damaris in an unsafe area. To learn that she was working was shocking, more so was that she desired to never marry. When he learns that his parents were also attempting matchmaking, Freddy devises a brilliant plan. What better way to ensure both of their goals than to engage in a fake betrothal? 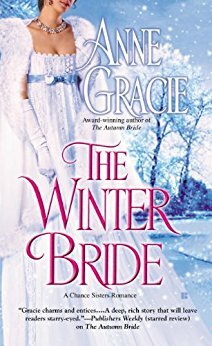 The Winter Bride was a wonderful, heartwarming romance. Freddy was already well established as having an aversion to muffins since his introduction in The Autumn Bride. He was dedicated, funny, but definitely hiding parts of himself. Damaris had endured much before meeting her sisters, and doesn't believe she truly has a chance at happiness. It was wonderful watching these two dedicated to never marrying find that they will only ever be happy together. Lucky for me, all four stories in the Chance Sisters series are already published and I hope to read The Spring Bride soon.